Last week the house voted in favor of a budget package that closed the deficit through spending cuts, without raising taxes, borrowing, or tapping the Rainy Day Fund. It included $830 million in spending cuts, wage freezes, and co-pay and premium increases for non-union employees, a pension cap for non-union new hires, and a reduction in the size of state government. The $830 million in cuts projects to more than a billion dollars in savings over the next budget cycle, dramatically reducing projected deficits. The cuts are almost $100 million more than in the Republican budget proposal. Through more than 6 hours of debate, the Republicans (unlike in many budget debates) declined to call their alternate budget for a vote as an amendment. The new budget reflects the priorities of the House Democratic caucus. It safeguards transparency by not including block grants, protects funding for hospitals, assures property tax relief in the form of the car tax and sales tax revenue for towns, defends the Citizens Election Program, and protects funding for Higher Education. 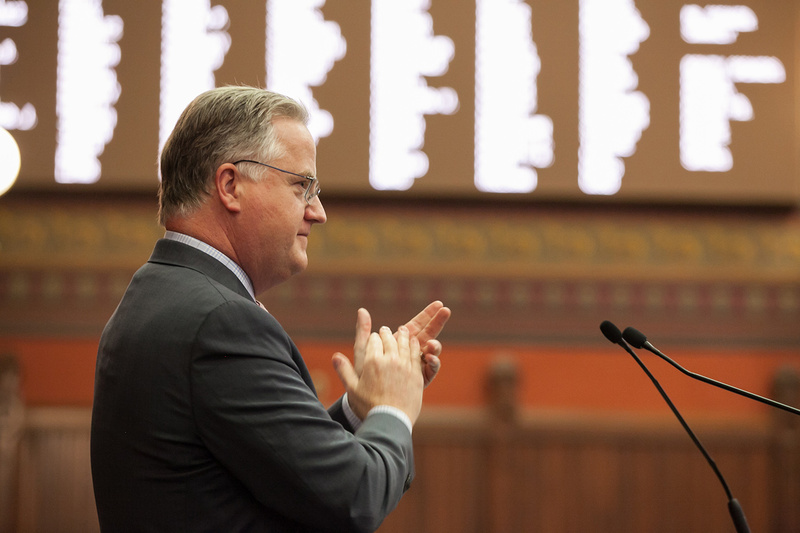 It is never easy to make cuts that will impact so many Connecticut families, but these cuts are real, structural change that will dramatically reduce projected deficits and will put CT's budget back on a sustainable path.